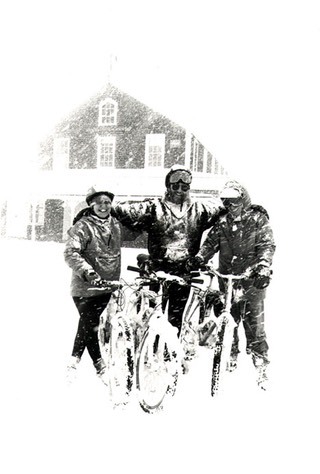 The Vineyard Off-Road Bicycle Association (VORBA) is an informal group bound by nothing more than a love of riding off-road on Martha’s Vineyard. There is no mission statement, no charter, no president, no board of directors, no dues, no treasurer (since there is no money), no application process, and no membership cards. If you want to be a member of VORBA, congratulations, you are one. Members include Islanders, washashores, summer folks, tourists, old coots, young fools, doctors, lawyers, carpenters, and the chronically underemployed, though truthfully nobody really cares what you are. We gather on Sunday at 9am for a morning of exercise and adventure through the wondrously beautiful and remote places of Martha’s Vineyard. The ride happens every single Sunday, regardless of weather, but you only have to show up when you’re feeling like it. David Whitmon founded VORBA around 1989, and he’s still around today, feathers flapping in the wind. Ashley Hunter leads the ride and maintains this website. Nobody voted Ashley these duties; he does them because he likes to and he’s good at them, and for that VORBA is grateful. VORBA is also eternally grateful to the Martha’s Vineyard Land Bank, and all the other property owners large and small who allow our ride to pass through. We endeavor to treat all land, and those we meet on it, with respect. Please join us for the Sunday ride. Every ride is different. You will see Island sights you’ve never seen, meet friendly people, and get to share a tall tale afterward over a cup of coffee, if you’re so inclined.